The Biblical account of the conquest of Canaan by the Israelites recounts that Dor was one of the 'five cities of the north' which joined Jabin, king of Hazor, in opposing Joshua. In the subsequent epic Israelite victory the king of Dor was killed and his army defeated (Jos. 11:1-2; 12:23), but the town itself was not destroyed and remained a Canaanite enclave throughout the period of the judges. Apart from the Bible, there is one remarkable Egyptian document which mentions Dor in the early Iron Age. The ‘story of Wenamun’ is an account of an Egyptian priest's journey to Byblos, in the tumultuous days following the loss of the Egyptian empire. Wenamun is robbed at the port of Dor, which was ruled at the time, according to this story, by Bdr, king of the SKL. The very same SKL are mentioned as one of the enigmatic "northern" invaders (the "Sea People"), who attacked Egypt in the 8th year of Ramesses III (1174 B.C.E) and later on, in the Egyptian "Onomasticon of Amenope", as a people inhabiting the coastal regions of Canaan, alongside the Philistines. 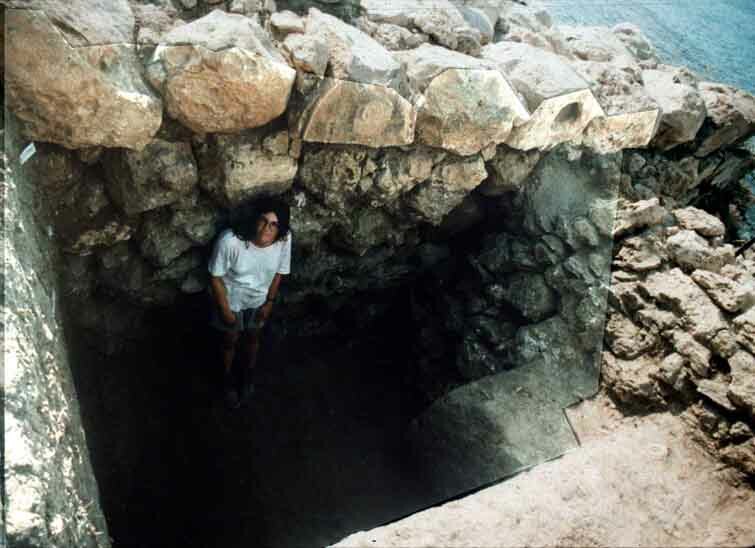 Although not specifically mentioned in any historical source involving the Phoenicians prior to the end of the Iron Age, the general development of the pottery repertoire and other categories of material culture at Dor in the Iron Age I finds its closest parallels in the Phoenician littoral. Whether or not it was actually a Phoenician polity during part or all of that period, its material culture, and perhaps its inhabitants, were predominantly Phoenician. Pottery and other finds attest to the lively trade the Phoenicians of Dor conducted with their neighbors, especially with the immediate "neighbor" to the west - Cyprus. This situation looms large in this "Dark Age", in which, in most regions around the Mediterranean, inter-regional commerce reached a very low ebb, or ceased altogether. According to the biblical book of Kings Dor was incorporated into David and Solomon's Israelite kingdom by the tenth century B.C.E. Dor became the capital of the Sharon province, under Solomon's new administrative scheme, governed by the king's son-in-law, Abinadab, the spouse of his daughter Tafath (I Kgs. 4:11). This period in the history of Dor, as well as the following one, when it was probably part of the northern kingdom of Israel (ninth-eighth c. B.C.E), are manifested by two strata, remarkable mainly for their respective fortifications. In the later of the two, a massive four-chambered city gate was built (similar to the one built, probably during the Omrid dynasty, at Megiddo). The end of the 8th c. BCE saw the great expansion of the Assyrians, and the devastation of the realm of Israel, along with all other kingdoms which tried to resist it. The Bible portrays these events as an unmitigated catastrophe (which, for the people of Israel, it was..) However, it is also true that the administrative schemes introduced by Tiglath Pileser III to fuse the conquered territories into an empire, endured for many centuries. Later conquerors - Babylonians, Persians, Greeks and even Romans, merely inherited and perpetuated a going concern. Part of the reason for the extraordinary stability of the imperial structure lies in economic benefits it bestowed. 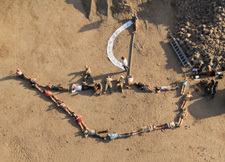 Here, again, the role of the Phoenicians - and of investigations at Dor - is considerable. Dor is mentioned in several Assyrian documents, indicating its importance. It certainly served as a commercial enrtepôt, or Kãru in Akkadian terms, and is usually also considered to have been a capital of an Assyrian province (the province of Du'ru). Whatever its earlier antecedents, all authorities agree that the great outward surge of Phoenician colonization across the Mediterranean took place in the late eighth and in the seventh centuries - precisely the time that the Phoenician homeland was actually losing its political independence. For the great land-locked empires - the Assyrians, the Babylonians and the Persians, the Phoenicians furnished access to the riches of the West. 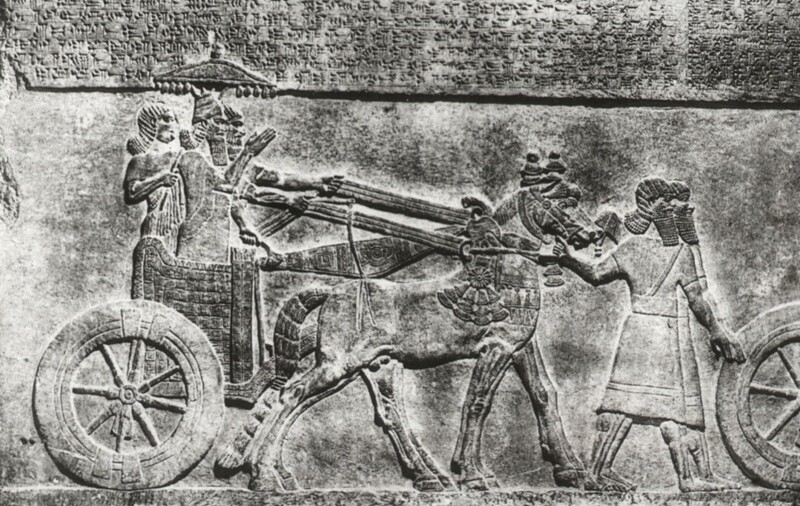 For the Phoenicians, contact with the Assyrians opened up almost limitless markets. Contrary to their summary handling of other vanquished peoples, the Assyrians (and the Babylonians and Persians after them) took great care not to harm the hen that lays golden eggs. This is the beginning of the 'orientalizing' period in Greece, the 'orientals' being (mostly, though probably not only) the Phoenicians. It is they who bring the alphabet to the Greeks, and initiate them into the arts of Egypt and Assyria. In the succeeding centuries, the Greeks would build on these borrowed beginnings their Classical culture. Unlike the devastation that seems to be the rule in most Israelite sites in the 8th-7th century, the evidence for an Assyrian destruction at Dor is limited, and seems to be localized at the area of the city-gate. The town quickly recovered, and the fortifications renovated. A new gate, this time with Assyrian attributes, was soon built. The subsequent city has evidence for industry and commerce in larger scale than ever. Two types of finds are conspicuously abundant: Assyrian tableware, alongside some Assyrian-type glyptics, and great amounts of Phoenician commercial jars. A 8-10 Section of Ir2b - Persian offset-inset city wall is reused in this phase. No significant structural remains inside city-wall. B1 8-13 Iron Age 1- 2a strata were found, under a set of later (Iron Age 2-Roman) gates and fortifications. C C1/7 IR2a: A section of a mudbrick wall - apparently a town wall of the offset-inset type, was found in area C1 under the later glacis. C C1/8 Deposits under the mudbrick wall; no structural remains. D2 6-7 IR 2b-c. Most of the area was open space during these phases, used for industrial activities in phase 6, and a large plastered courtyard in phase 7. D2 8 IR 2a. Several building complexes: the 'monumental building' and a more modestly built house (nicknamed 'Benni's house) on the north. D2 9-10 IR 1b: The 'monumental building', 'bastion' and 'sea wall' were all built in local phase 10. D2 12-14 Iron Age 1a/1b: several successive strata between bedrock and the monumental constructions of the Iron Age 1b. G 6b-7 The IR 1|2 transition in area G is marked by nothing more than the gradual raising of floor levels within the same houses. G 9-10 IR1; represent small-scale industry. Local phases 6-7: Most of the area was open space during these phases. In phase 6 this space was used for industrial activities. Piles of industrial wastes contain evidence for Iron processing and shards of many hundreds of Assyrian-period storage containers. In phase 7 the center of the area comprised of a large plastered courtyard, but at the edges corners of two large public structures appear: The 'monumental building' (see below) on the southeast quadrant of the area may have still been in use, in its last phase, in this period. The wall of another building - constructed of monumental ashlar blocks, appears in the northwestern corner of the area. Iron Age 2a and the Iron Age 1|2 transition Local phase 8: The area can be divided up to several building complexes: The SE quadrant is occupied by a monumental structure built of large boulders with ashlar construction in its corner. 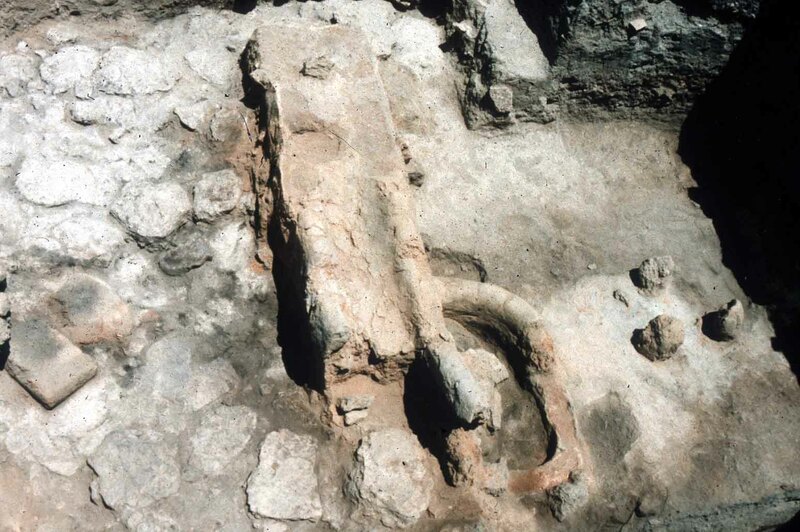 This building may have originally been as large as 20 x 40 m. or more, but only 10 x 10 have thus far been excavated. 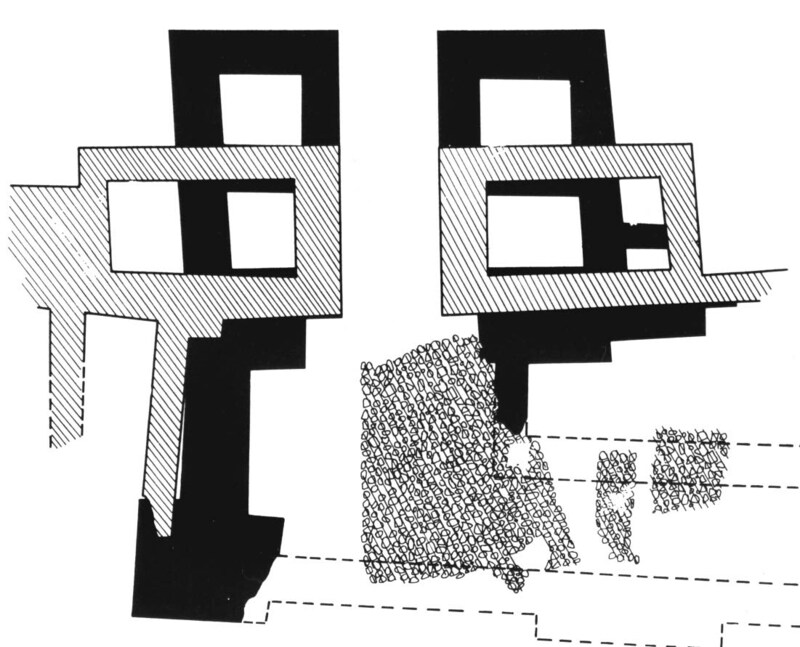 Several reconstructions and many floor levels were noted, spanning the Iron Age 1b (see below) to 2a, and perhaps also 2B (above). Along the western edge of the area is another massive structure - so far known only by its eastern wall, also built of boulders. This wall appears to curve around the natural kurkar ridge that has its edge here, earning it its nicknames 'the bastion' or 'the acropolis' wall. The 'bastion' is connected to the 'monumental building' by yet-another boulder wall - the 'sea wall' which forms the southern edge of the excavation area. The space between 'the bastion' and 'the monumental building' was used in phase 8 for a more modestly built house (nicknamed 'Benni's house)on the north. The center of the area was a courtyard framed by 'Benni's house' on the north, the 'bastion wall' on the west, the 'sea wall' on the south and the 'monumental building' on the east. 'Benni's house' collapsed and was rebuilt several times, and the adjacent courtyard was raised and repaved with each rebuild. These rebuildings and resurfaces, and their associated assemblages, mark the gradual transition from the Early Iron Age to Iron Age 2a. Some of the important finds, such as a hoard of silver tokens - one of the first markers of pre-monetary economy, and some of the earliest Greek pottery in the Levant were buried under the successive surfaces of the courtyard. Following an intermediate phase (11) are local phases 9-10: The 'monumental building', 'bastion' and 'sea wall'(see above) were all built in local phase 10. This phase and the subsequent one (9) exhibiting the material culture of the late Iron Age 1 (Ir1b in Dor terminology) - including the earliest 'Phoenician Bichrome' wares and the earliest Cypriot (Cypro-Geometric IA) imports. The main structure of this horizon was found beneath 'Benni's house' of phase 8 and the courtyard. It is a mudbrick storage facility, consisting of long narrow halls. This structure abuts the 'bastion' and 'sea wall' but is separated from the 'monumental building' by a wide slab-covered drainage channel. Local phases 12 - 14: are several successive strata between bedrock and the monumental constructions of the Iron Age 1b. 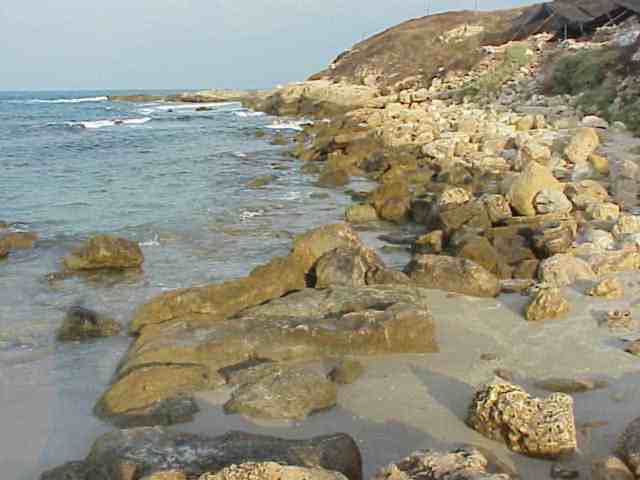 They feature a wide wall built of small fieldstones, parallel to the seashore (the earliest precursor of the 'sea wall'?) and several phases of construction, also in small fieldstones ('Nati's house'), abutting it. The earliest remains of ancient quays - a massive pavement of flat stones sloping into the southern bay, may date to these phases. 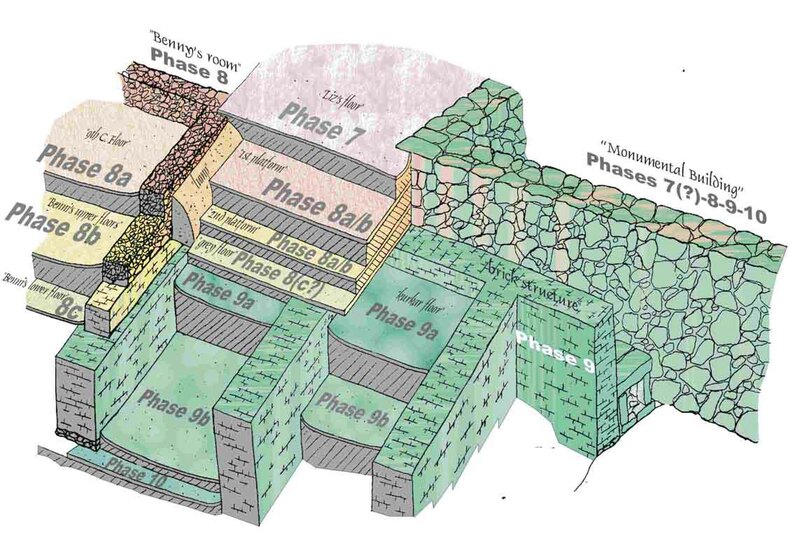 Local phases 5-6a: Phase 5 is so riddled by Persian pits as to defy the reconstruction of its plan. In phase 6a the character of the area is residential, house construction typically being of combination of fieldstones for some walls and mudbrick (usually, but not always, on stone socles) in others. Local phases 6b-7: The Iron Age 1|2 transition in area G is marked by nothing more than the gradual raising of floor levels within the same houses (6b to 6a). Phase 6b too is merely a rebuild of phase 7, most phase 6 walls following the lines of their phase 7 predecessors. In one of the rooms a skeleton of a woman was found, apparently trapped under a wall collapse. Local phases 9-10; local phase 8 is a transitional phase. Architecturally, there is a gradual evolution from phase 10 to phase 6. The basic division walls are reused (or rebuilt on the same lines), while partitions are shifted. Functionally, phases 9 - 10 in G represent small-scale industry. The phase 9 house was devoted to food production and storage (apparently at more than household consumption level). The main courtyard had a large installation with a working surface and several bins - perhaps for the grinding of flour or the kneading of dough. Another room was littered with the skeletons of small fish, and may have served for preparation or curing of those, or for storage or maintenance of fishing gear. 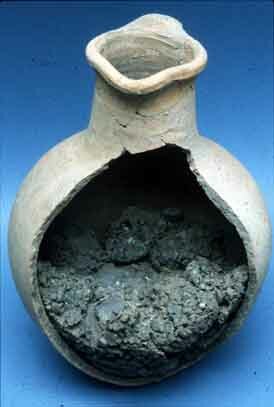 A third room had a plaster floor with basins - perhaps for grape-treading, and fourth room was found full of storage jars, including many imported from Egypt. This house was destroyed by a terrific fire at the end of phase 9, which preserved its contents and serves as a benchmark for the 'Ir1a' horizon at Dor. The phase 10 structure was a smithy - apparently engaged in scrap-copper recasting. Most of the finds, including a furnace, a bellows-pot, tuyeres, crucibles and many small fire pits, are related to this industry.